« New Job – A Van Driver! 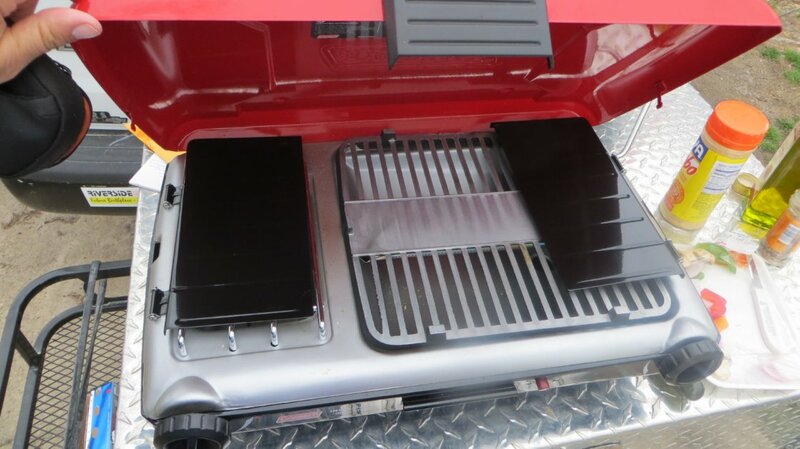 A stove and grill in one adds some flexibility to your camping cooking! Disclaimer – The opinions listed here are my own. You may not agree with them and may not experience the same results. This information is provided for your entertainment. 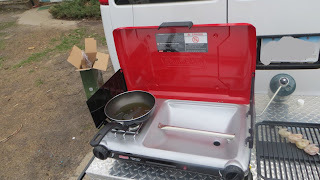 Well, here’s the latest and greatest gadget for the van… a Coleman “PerfectFlow Insta Start” propane stove / grill combination. I ordered it from Amazon. The stove and cover together ran about $115. Thankfully there was a $20 instant rebate and, of course, Amazon’s free shipping. (That’s okay if you don’t mind the package going from Kentucky to Kansas to Chicago and back to Iowa). some foil in the pan area first for easy clean up. 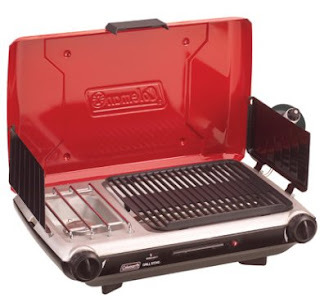 The grill itself opens like a laptop – in a clam shell fashion. Then the hinged metal “wings” fold upward and latch into place, holding the lid up and blocking the wind. 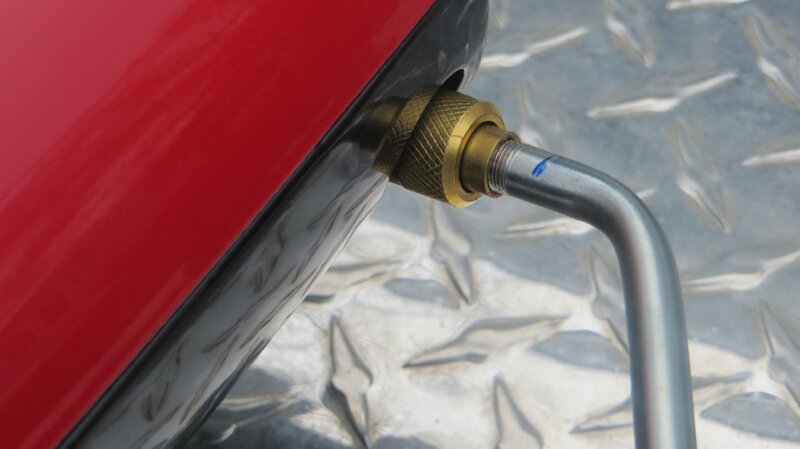 The propane tank screws on to a tube as you can see in the pic. There is a burner to the left and a grill to the right. When done, you fold it back down and away you go. Grill surface in place with foil covering the pan. Note hole poked for the drip pan. Based on recommendations, I added some aluminum foil under the grill to make clean up a breeze. You just line the drip area and poke a hole in the foil to allow the drippings to fall into a plastic drip pan which sits under the grill. The little drip pan is about the size of a piece of Texas toast. If I ever have to have a “last meal” let it look like this! 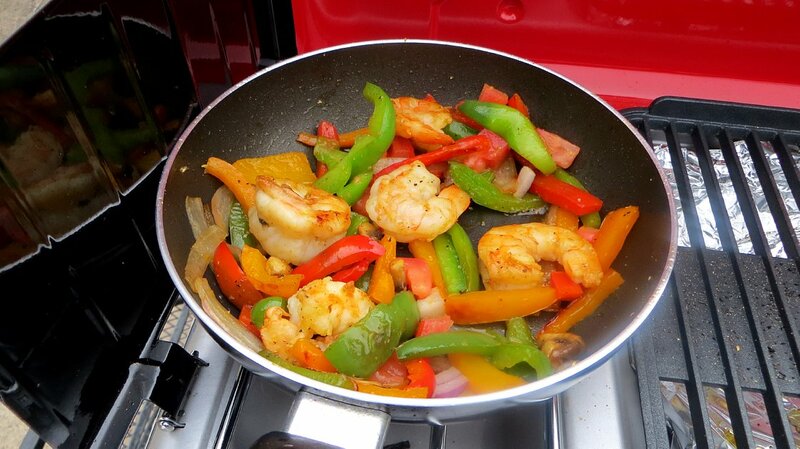 The first dish made was a batch of shrimp fajitas in a small skillet. 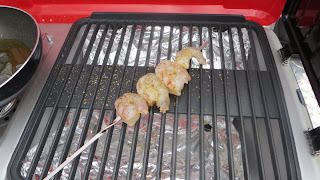 The grilled shrimp skewer shown above was for the official taste tester, Mr. Jesse (my tomcat). As you can see, the small skillet (about 8″) was as large as could be accommodated. If you are cooking with something bigger you can fold the “wing” (on the left side) down out of the way. But we are camping, right? Hopefully most of the cookware won’t be humongous… at least not for van camping folks like the author! One concern is that folding one of the “wings” down would cause the red lid to be loose and it could flop over in the wind. (sort of like taking one sidewall out of a garage and and wondering why the roof flies off in the wind!) Folded down, the black wings can be used as little shelves but are too light weight for anything more than a spatula, basting brush, etc. Don’t expect to set a pot of beans on there! If a little heavier guage of steel had been used, this would have been a helpful feature. 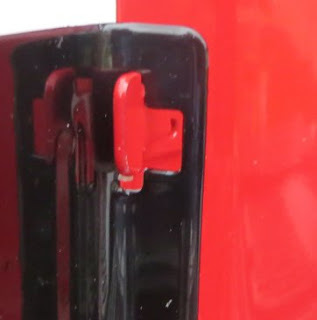 The tab on the lid sits in a hole in the thin metal of the wing. My other gripe is minor as well. The knurled nut that secures the regulator tube (the tube connecting the propane) does not give a person with fat fingers a very easy way to tighten it. I’m not even going to call that a con… It’s not that annoying. Try and get fat fingers around that! Overall, I did like the performance of the grill and optional case. The stove burner cooked the fajitas quickly (and deliciously!). 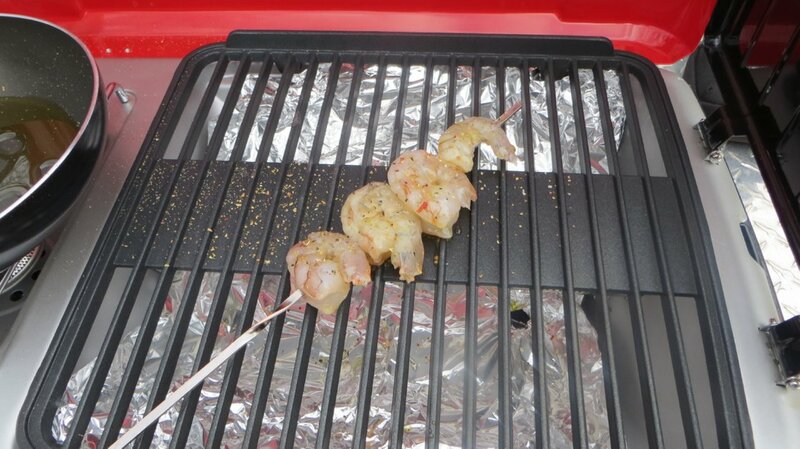 The grill part cooked Jesse’s shrimp perfectly. He was a “happy camper”. Update – 04/17/2013. 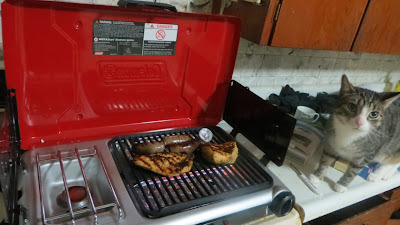 To test the grill further, I cooked marinated chicken breasts and bratwursts this morning. Thanks to some heavy April rains, it had to be done in Dad’s house… and with the help of Jesse James. He liked the marinated chicken… Who wouldn’t? In some online reviews, they recommended cooking the meat over the center of the grill… You can grill it a little slower off to the side and, as we steak lovers know, indirect cooking can be a good thing. But as I added some lovely carcinogens to the bratwursts, I burned them right over the flame, stinking up Dad’s kitchen and setting off the smoke detector. The chicken breasts did the best over the center flat area. Just a sidenote… Keep a meat thermometer handy. I cook the meat till it’s just done – not like the dried out chicken Dad complains about at the nursing home… 🙂 When a good quality ribeye steak costs $18 / lb at the premium meat market, it’s worth the investment for a thermometer. It is easy to assemble (the only one-time assembly is to attach feet with screws). The stove burner works well and is quite hot. The blue flame is uniform. 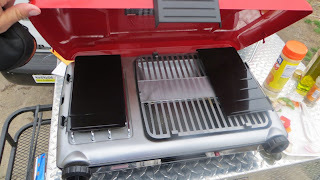 The grill works well and is easy to clean. The meat/ flame spacing is effective. The unit closes up and stores neatly. The stove/grill is large enough to easily cook enough food for two people. Low fuel consumption. I used it for an hour and consumed maybe.. 1/2 pound of propane? It is so dang convenient! That’s the biggest pro! The wind guard wings are a little flimsy and can detach too easily. Don’t use in higher winds! The skillet area is small – you have to unhook the left wing for a larger skillet or sauce pan. The gas controls are touchy. You only really use 10% of the knob’s travel. The unit barely fits into case. Storing it is like a teenager wriggling into skin tight jeans. 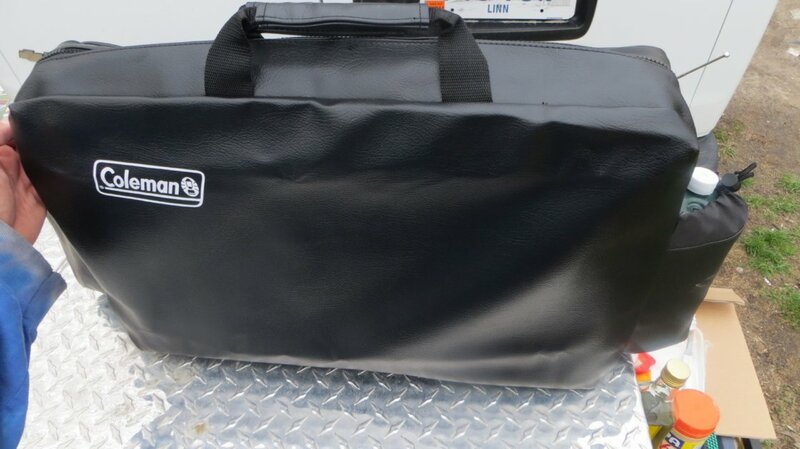 The case and grill are quite long, particularly if you store a bottle of propane in the case. The grill system is a bit pricey for what it is. But with the Coleman rebate, you can’t go wrong! To stow: Just flip the grill portion over, and close it up! With all that being said, I will give this grill a solid 4 / 5 star rating. It met the expectations and I think it does an excellent job. It’s convenient. So why four stars for something with some cons? Because I have not found anything I like better and the strengths outweigh the weaknesses. propane connection tube, and a green tank of gas. This grill does take up a fair amount of space and I don’t think it will go out on every van trip with me until I figure out exactly where to put it. But the Coleman PerfectFlow Insta Start does work very well and allows a person to make a home cooked meal without a major time and money investment in a charcoal fire. Had the wings been a little more sturdy and the gas controls easier to modulate, I would have given it a 5 star rating. It’s a nice little addition for camping trips. If you can get past a couple of quirks, I’d say this cool stove/ grill might be just the solution. I would buy it again… in a heartbeat. The next post will discuss what I have learned about driving a van for the railroad crew in the area. It’s a awesome job for a single guy. And it’s fun, too. My desk is a 1 ton van and the office environment is a train yard. More details on that coming up soon! I’ve got one and it’s just about replaced all my other pans for general use. Whoops! Thought I linked you to the smaller one. The smaller one comes with a set of cooking chopsticks. I was doing some surfing but am having difficulty locating a 9″ model. When I do, I’ll buy it. Sounds like it will work for what I need. Thanks! Would be good to have around at home when the power goes out and the electric stove doesn’t work. Wonder if there’s an adepter to hook up one of those large propane tanks to it. I just added this stove to my Amazon store and right now it is reduced to $85. You are way too good to that feline food tester! That much is certain! He’s got a sense of entitlement around dinner time. The little guy got the name “Jesse James” for stealing food from my plate while I was in the other room. Getting by with the crime set a precedent.